The Indians started off the season quite differently than expected. Sure, the offense wasn't expected to be a powerhouse (and it's not, placing 29th in team batting average at a blistering .153 pace). But the surprise took place beyond the outfield, in the sanctuary (literally and figuratively) that Tribe fans though would be the calming influence on the team all year--the bullpen. Cleveland led all three games over the weekend, yet only won one versus the Blue Jays. 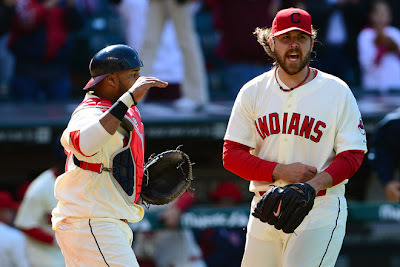 Thursday's Opening Day loss was executed in spectacular fashion, with Chris Perez blowing a three run lead in the ninth, and the Indians then going into a seven inning slumber and the bullpen finally succumbing in sixteen innings. Saturday the team had a two run lead, that given up by Ubaldo Jimenez in the seventh, and the bullpen proved unable to hold on and ending up losing in extras, with Tony Sipp imploding in the top of the twelfth. Chris Perez righted his ship to complete Carlos Santana's birthday win. The Tribe offense is nothing if not predictable, scoring exactly four runs in each game this year, which puts the team more or less in the middle of the pack. (To compare, the underwhelming Indians averaged 4.35 runs per game last year.) And in reality, that has been plenty for the 2012 starting pitchers to work with, as Masterson, Jimenez, and Lowe have all put together very nice starts. The issue is twofold--the utter anemia of the core offensive stats (29th in the league in BA, 25th in OPS) to score more than they have, and the inability of the bullpen to hold leads in two of the three games.) If it weren't for Carlos Santana's birthday, the view would be much worse. In my opinion, it's not panic time. I would hope that would be obvious, but by the showers of boos and social media vitriol rained down on Chris Perez on Thursday, panic time had fully arrived roughly three hours into the 2012 campaign. The bullpen should be a strong point for the Indians this season--a position of strength even when the trading deadline approaches. (Let's consider the 2005 Yankees. Mariano Rivera blew two saves in the first three games, and the New York media pronounced the "era of Rivera" over.) The offense will continue to be a soft spot, but can not conceivably be this poor throughout the entire season. Not every pitching start will be as good as the first three this season. But if the pitching ship can be righted, from beginning to end of the games, the Indians should be a respectable position once one of the Tigers' overweight hitters goes down to injury all season. Three down. One hundred fifty nine to go. That's a long yellow brick road the Indians still have to walk.